The summer holidays are over and everyone this week seems to be heading back to work; I had forgotten about traffic queues and dull grey skies but both are back with a vengeance this week! Thankfully it’s now Friday and we have the weekend. With the thought of returning to work, I realised I had missed (just a little) my fabulous work bag, that I cannot live without! About a year ago my office role changed with me heading out into the field and that really impacted my wardrobe. Basically I needed to carry my entire office around with me. Twelve months on, I can now confidently say I could work anywhere in the world, with this bag and WIFI. I started the new role with my black and very boring IT laptop bag that’s issued out as standard, and after a couple of weeks, I just thought this is too dull for me! I wanted my laptop bag to look feminine, stylish and to mimic a handbag. Sadly after a full day of hunting around the shops, specialised and department stores, they could only offer me unisex (a word I personally do not do!) and colours of either grey or black – no one seems to be catering for the business woman? And sadly all shops referred me to their online stores; it seems we don’t justify any floor space in shops! Now I know some ladies simply use a big tote bag to get around this issue, but that doesn’t support or keep safe the equipment from damage. 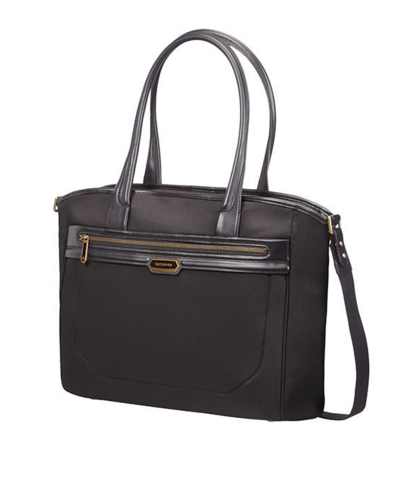 I also need lots of compartments and pockets to store other office time items that a desk is so handy for. I need to set up my working environment in less than a few minutes and at the end of my meeting pack it all away again – so every item needs a home – I can’t just throw it in. I settled on the Samonite bag above from their Intregra range (which is no longer on their online store but I found it on Bags Direct). The one above is black, however I opted for Espresso brown which I feel changes colour. Some times it’s a dark brown and some days it’s more an olive green regardless it works so well with whatever I have chosen to wear. It’s important in a professional environment to look the part; people make decisions instantly on how you look, unfortunately. And so what you wear and how you come across in those first few minutes will make a lasting impression. Think about what it is you want to get out of your day – and then ask the question, is how you look helping you achieve that? Rightly or wrongly us ladies have to make that extra effort; for the promotion, the attention and the equal pay packet! And maybe this journey has to start with how you carry your laptop?